Not to alarm you — and please don’t call your wealth manager immediately after reading this — but the entire world is going to cash. Bank of America Merrill Lynch (BAML) sent around a report tracking global fund flows, and since the second half of last year, cash has been the most popular asset in the world. Over that period, about $7 billion went into the stock market. Fixed-income funds saw $46 billion in outflows, which BAML thinks is mostly due to redemptions from the credit markets, as opposed to, say, the government bond market. Over the same period, $208 billion went into cash. When we say “cash” we mean the cold, hard stuff, and anything that can easily be converted into it. That includes money-market mutual funds and bank deposits that carry interest. It basically means investors are taking their money out of the markets and sitting it out. BAML said investors are effectively selling inflation and buying deflation, or the continued decline in the value of asset prices. The week ending January 27 saw the largest outflows from Treasury Inflation-Protected Securities — which are supposed to provide protection from inflation — in 33 weeks. 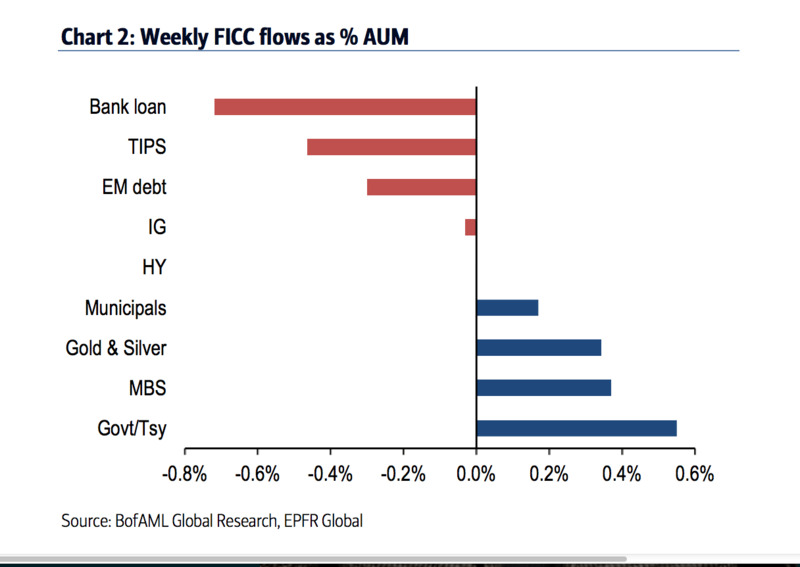 It also marked the 13th straight week of outflows from bank loan funds and the seventh straight week of outflows from financials. “All votes of no-confidence in the economy,” BAML said in the note. In contrast, there have been four straight weeks of “robust inflows” into super safe government and Treasury bonds, and 19 weeks of inflows into muni bonds. 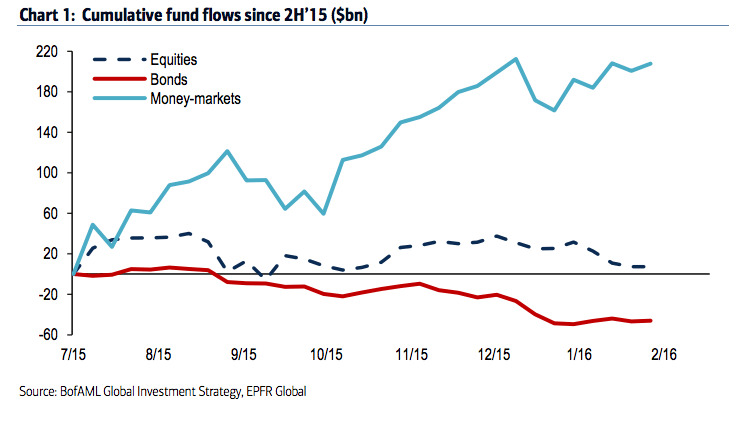 There have been huge inflows into money-market funds, while bond funds have seen outflows. Super-secure government and Treasury funds have seen four straight weeks of inflows, according to BAML.